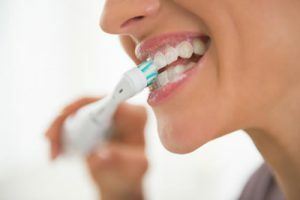 Adults should use any toothpaste containing fluoride. The more expensive toothpastes are not necessarily any better. If you have decay, or have had many fillings previously, talk to your dentist about using a high strength fluoride toothpaste. Whitening toothpastes are more abrasive and can damage teeth, however are reasonably effective at limiting staining from smoking. The most important time to brush is just before bed; food left on your teeth will cause decay while you sleep. Whether you use a manual or an electric toothbrush, you should brush for 2 minutes at least twice a day. Look for a toothbrush with soft or ultra-soft bristles. Never use a medium or hard brush. Electric toothbrushes can be great for kids, people who tend to brush too hard or have manual dexterity difficulties. Find a floss that works for you! If you are finding it difficult to get the floss between your teeth, try a ribbon or ‘satin’ floss. If you can’t manage to floss, there are many widgets on the market to help including floss holders (Reach access flosser) and interproximal brushes (Piksters, TePe brushes). Interproximal brushes are good for large spaces and braces. Many people find it difficult to floss initially. Please ask your dentist to show you how. Try and floss every time you brush. Using a mouthwash never replaces brushing and flossing. Most people do not need to use mouthwash regularly. However your dentist may suggest a specific mouthwash for you, for a short duration to help resolve bad breath after your teeth have been professionally cleaned. If you do want to use a mouthwash, alcohol free is preferable. Children should only use alcohol free. Some mouthwashes feel like they are burning your mouth. Unfortunately, this does not mean they are doing a better job cleaning your teeth. After brushing, flossing and rinsing with water.